Let’s prove the Pythagorean Theorem. Both figures shown here are squares with a side length of $a + b$. Notice that the first figure is divided into two squares and two rectangles. The second figure is divided into a square and four right triangles with legs of lengths $a$ and $b$. Let’s call the hypotenuse of these triangles $c$. What is the total area of each figure? Find the area of each of the 9 smaller regions shown the figures and label them. Add up the area of the four regions in Figure F and set this expression equal to the sum of the areas of the five regions in Figure G. If you rewrite this equation using as few terms as possible, what do you have? Take a 3-4-5 right triangle, add on the squares of the side lengths, and form a hexagon by connecting vertices of the squares as in the image. What is the area of this hexagon? Find the unknown side lengths in these right triangles. Use the applets to explore the relationship between areas. Consider Squares $A$ and $B$. 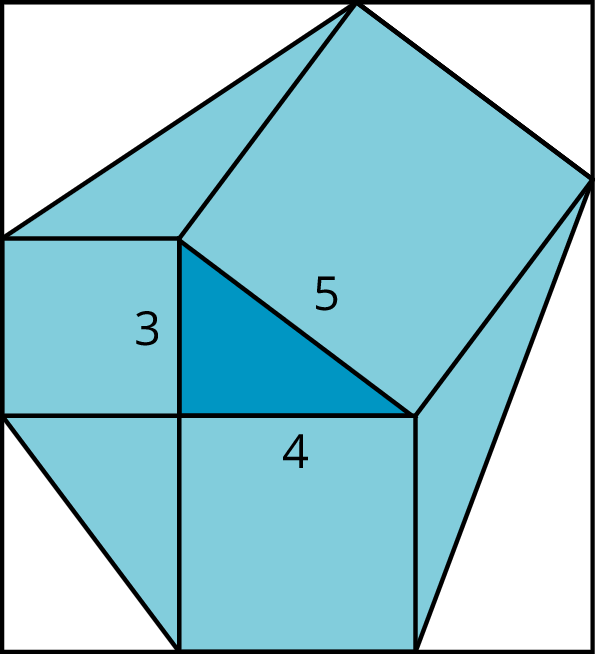 Check the box to see the area divided into five pieces with a pair of segments. Check the box to see the pieces. Arrange the five pieces to fit inside Square $C$. Check the box to see the right triangle. Arrange the figures so the squares are adjacent to the sides of the triangle. If the right triangle has legs $a$ and $b$ and hypotenuse $c$, what have you just demonstrated to be true? Try it again with different squares. Estimate the areas of the new Squares, $A$, $B$, and $C$ and explain what you observe. Estimate the areas of these new Squares, $A$, $B$, and $C$, and then explain what you observe as you complete the activity. 4. What do you think we may be able to conclude? The figures shown here can be used to see why the Pythagorean Theorem is true. 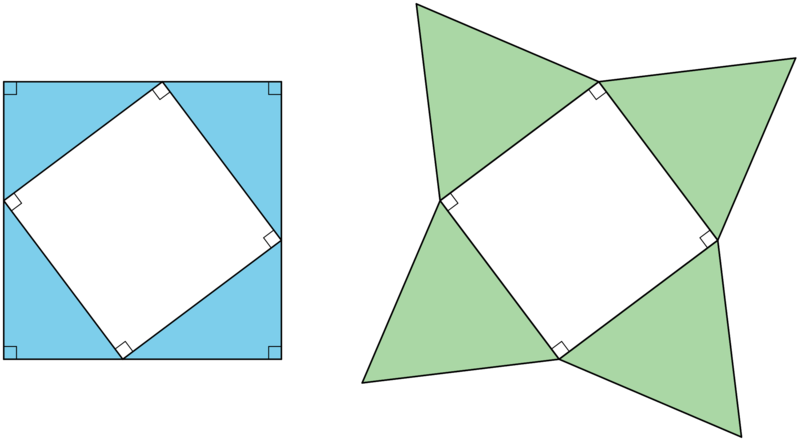 Both large squares have the same area, but they are broken up in different ways. (Can you see where the triangles in Square G are located in Square F? What does that mean about the smaller squares in F and H?) When the sum of the four areas in Square F are set equal to the sum of the 5 areas in Square G, the result is $a^2 + b^2 = c^2$, where $c$ is the hypotenuse of the triangles in Square G and also the side length of the square in the middle. Give it a try! Since this is a right triangle, $24^2+7^2=c^2$. The solution to this equation (and the length of the line segment) is $c=25$.